Thanksgiving has come and gone and my house is slowly turning into a winter wonderland. We have a tradition of putting up our Christmas tree the Saturday after Thanksgiving (and actually found out we were pregnant with Ford that day in 2012!). One thing that excited me about moving to the suburbs a few years ago was holidays. I imagined spending Halloween with our neighbors (which we did) and delivering treats at Thanksgiving, Christmas, Valentine's Day...this girl loves holidays. We aren't to the point of life where we have teacher gifts yet but I love coming up with small little gifts and treats for our friends and neighbors to show them that we care about them during the holidays. White chocolate snack mix was the winner for Halloween and Cinnamon Chip Pumpkin Muffins for Thanksgiving. I knew I wanted to hand deliver our Christmas cards to our neighbors and add a special gift but wasn't sure just what. 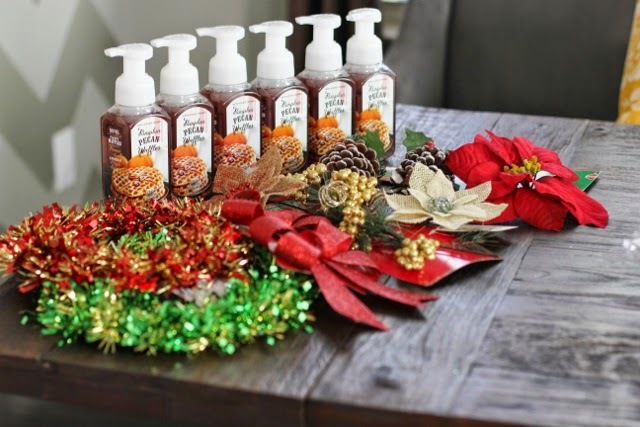 I am a sucker for Bath and Body Works hand soaps (as Jon!) 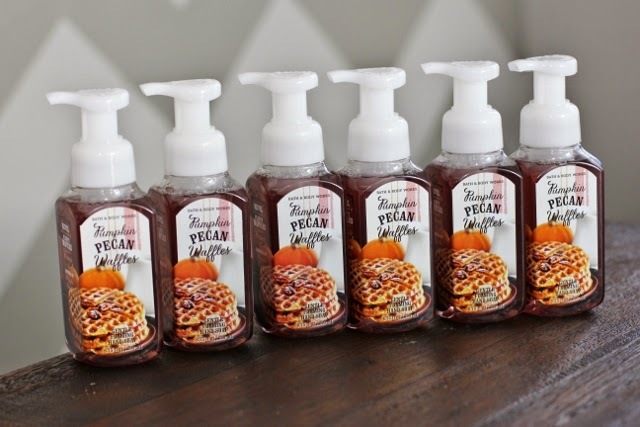 and we recently became obsessed with one of their seasonal scents, Pumpkin Pecan Waffle. I can smell it as I type! Bath and Body Works must know my weakness because they send me killer coupons that are silly to waste. Because we have enough soap to last us until Ford goes to college, we cashed in our coupons for Christmas gifts. 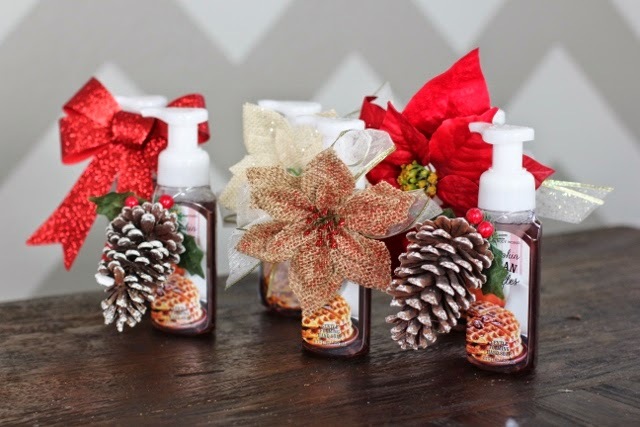 I didn't want to just hand over a bottle of hand soap and our Christmas card so I turned to my crafty (and thrifty) side to spruce them up. 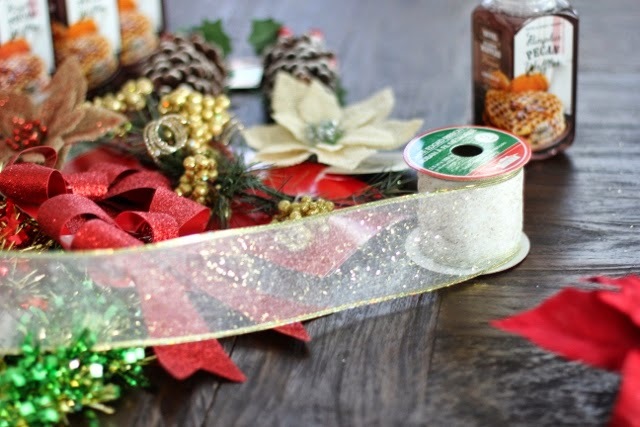 I shared my new love for holiday decorating at Dollar Tree back in October and I am back again to rave about the endless Christmas possibilities Dollar Tree has to offer. Ornament packs, garland, bows, wire, ribbon....all for a dollar. Cha-ching! 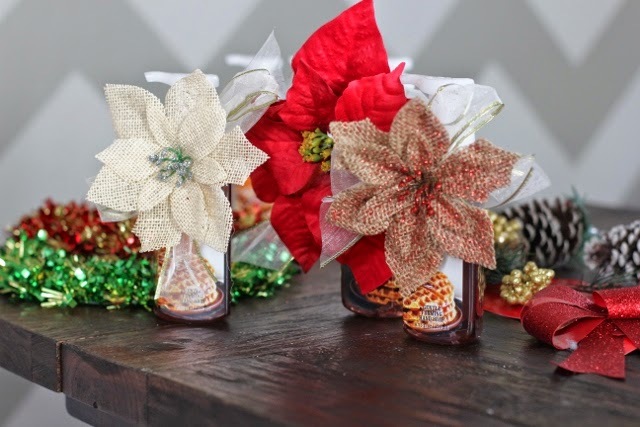 I chose some pinecone ornaments, burlap poinsettias (burlap is very in right now), and pre-made glitter ribbons to add some Christmas fun. Everything is bigger in Texas.... even the Christmas poinsettias! I can't wait to gift these to friends and neighbors! It's no secret I love saving money and love sharing it with my readers. 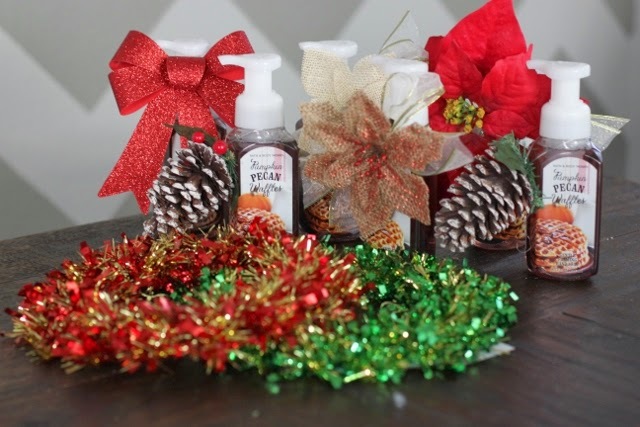 Be sure to visit your nearest Dollar Tree to stock up on all your holiday decor and necessities! 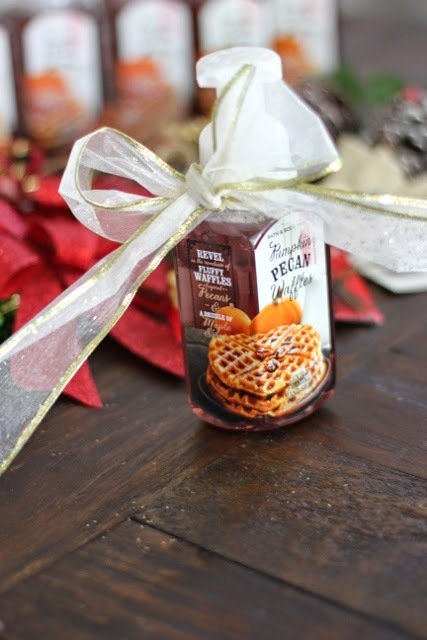 You can also visit www.ILeaveHappy.com for additional holiday decoration and entertaining ideas and tips.